View of some old cottages at Rose Lane in Oxford. Rose Lane is one of the roads of the medieval town and is off the high street, south east of Merton Street. It was originally Trinity Lane in the early 17th century but by 1751 it was Rose Lane. 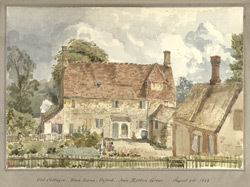 Today the area has been taken over by Merton College's buildings and these cottages no longer exist.